A traditional and substantial house in the village of Kalavassos. It is set around a courtyard, with balconies facing in to the communal gardens. The house can be rented as a whole as a very spacious 5 bedroom house, or as separate apartments consisting of 3 one bedroom and one two bedroom flats. There is swimming at governors beach, horse riding, fishing, cycling and walking the nearby nature trials. A real Cyprus village house in a real Cyprus village. Each bedroom has twin beds. All the bedrooms have optional air conditioning. Flat 1 - 2 beds in the bedroom and there is a huge lounge/kitchen area 3 times the size of the bedroom which has a double sofa bed and a single sofa bed. Flat 2 - 2 beds in the bedroom and huge lounge/kitchen which has a double sofa bed. Flat 3 - 2 beds in the bedroom and huge lounge/kitchen which has a double sofa bed. Flat 4 - 2 beds in one of the 2 bedrooms and 3 beds in the other and a huge lounge/kitchen which has a double sofa bed. Each apartment has an open plan living /dining and kitchen area. The kitchens are fully equipped with a cooker and fridge. There is a washing machine for use by all guests. Each apartment has a TV. The house is centrally heated in winter. There is also a central pay phone. There is a large colourful garden and courtyard for al fresco meals. 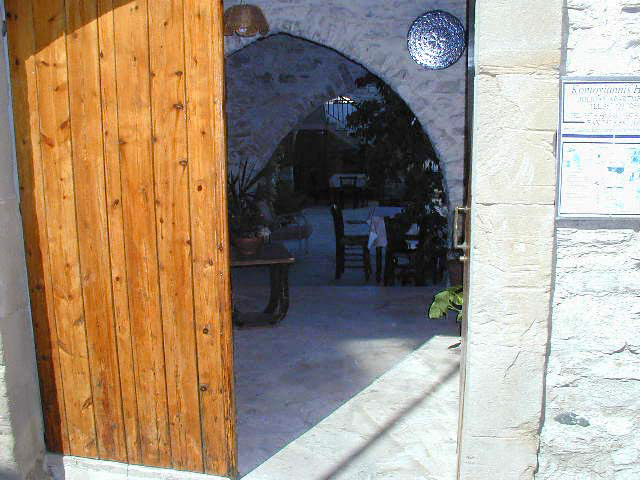 In this delightful garden there is a traditional clay kleftiko oven and a large BBQ. too far to the Beach. 5 mins Drive instead. Prices are per apartment. The 1 bed flats sleep 2, the 2 bed 4. Extra beds are available as below. Children 2 years of age and under are free. Baby cot is available free of charge.